My name is Michael Grogan, I am an independent trader and market researcher. 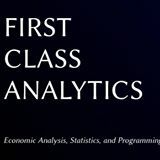 I founded First Class Analytics for the purpose of providing up-to-date analysis of the financial markets. In particular, I am particularly engaged with the more quantitative elements of economics and finance, with my articles frequently drawing on regression analysis and statistical forecasting techniques to identify market trends and possible trading strategies. If you’re a startup, then having a data science strategy in today’s world is essential. Your organization simply cannot function without it. So, how can you make sure you are capturing the maximum benefit from this technology? In the past month, the iShares MSCI Sweden ETF has fallen almost 7 percent from 34.75 to 32.37. Time To Go Long AUDJPY? The Japanese Yen has taken quite a tumbling recently due to quantitative easing and concerns of low domestic growth The AUD has been struggling to gain traction against the U.S. dollar, while ranging against other currencies such as the euro. Since mid-June the yen has been appreciating significantly against many major currencies, including the Aussie dollar. The appreciation has been spurred mainly by comments from the Bank of Japan that a selloff of JPY is overdone. Given that much of Norway's economy has relied on the export of energy and other natural resources, a drop in commodity prices may make Norway an attractive value proposition compared to other European markets. I am an independent trader and market researcher. I founded the First Class Analytics website for the purpose of providing up-to-date analysis of the financial markets. In particular, I am particularly engaged with the more quantitative elements of economics and finance, with my articles frequently drawing on regression analysis and statistical forecasting techniques to identify market trends and possible trading strategies. Fields of study: Business/Economics. First Class Honours (Ranked 1st in class). Welcome to the First Class Analytics website. My name is Michael Grogan, I am an independent trader and market researcher. I founded the First Class Analytics website for the purpose of providing up-to-date analysis of the financial markets. In particular, I am particularly engaged with the more quantitative elements of economics and finance, with my articles frequently drawing on regression analysis and statistical forecasting techniques to identify market trends and possible trading strategies.